The controversial EV set a new record on the rather difficult Pikes Peak race track, beating Tesla Model S by a staggering 23 seconds. Faraday Future is back in the news, and this time, it is on a positive note. The company took to the Pikes Peak race track, set 14,115 feet high on Pikes in North America, and has set a new record for the fastest lap time there, yet. 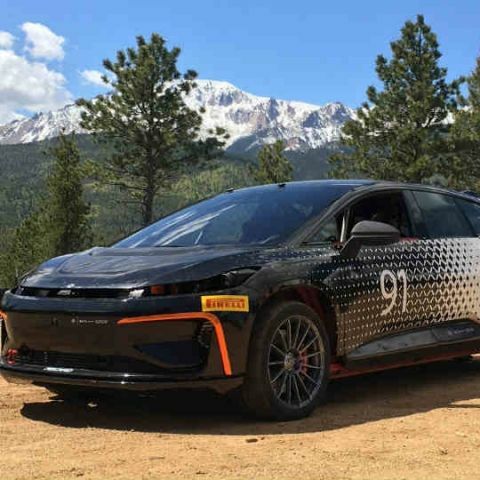 The Pikes Peak race track is nearly 20 kilometres long, and has 156 turns and 4,720 feet of ascent along the arguably difficult terrain, and Faraday Future's production-designed FF91 electric vehicle completed the course in 11 minutes, 25.083 seconds. This is the fastest time set on this course, beating the previous record holder - incidentally also an EV manufacturer focused on futuristic vehicles, by nearly 23 seconds. The previous record holder was the Tesla Model S.
There has been much talk about Faraday Future ever since its inception. The company was once touted to be the next big thing in the world of automobile development, and teamed it up with an uber futuristic presentation of its concept FFZERO1 vehicle that had everyone excited. Then came the difficult times, after parent company LeEco ran into dire straits. There were talks of high profile employees leaving, battery plants taking a hit in production plans, and the overall lack of information from FF's stable led to serious doubts about its potential. Then came a surprisingly encouraging presentation with the production-designed FF91, which seemed to put the company right back on track. The company has since then released a number of video footages to remain in the news, showing the car trundling along city roads, exhibiting its augmented displays and understandably sleek design, and maneuvering itself. FF's vice-president of powertrain and battery systems stated in a statement after climbing Pikes Peak, "we're proud of our time, but this is about the quality of our propulsion system more than just a one-time race. Our focus was on repeatability - to reach the peak without overheating the vehicle, and to be able to do so again and again." Despite the positive signs, there is still a lot of difficulties to combat. The biggest of its problems happen to be its factory plans in Nevada, which is nowhere near completion. Funding for production of the FF91 can also be an issue, but if the company does survive the obstacles, it is expected to present a 1050bhp all-electric monster on the road with driving range of 608kms and 0-100kph acceleration in just 2.39 seconds. Can windows os take on android in coming future? Can someone track down an IP address on PS3? Best laptop for Music Production?